Though there are more than 2000 pagodas in Bagan, most people go only about 20 places which are popular and readily on the road of tour packages. But there are still many more wonderful places which are not popularized. 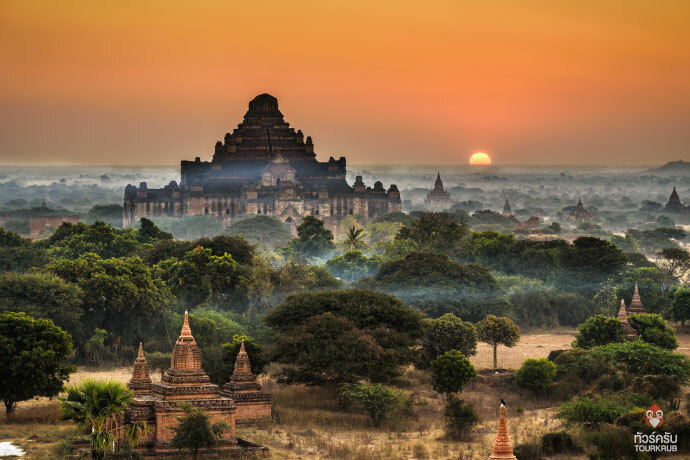 Here are 5 breathtaking places of Bagan which you may not have heard of. It is one of the only four buildings which were built of sand stones in Bagan era. When you are on flight to Bagan and the plane crosses over Ayeyarwady river, you can see that the deep river shore has a grand building. That building, Kyouk-Gu-Ou-Min was made of sand stones in foundation and topped with bricks. Unlike other temples in Bagan, all the windows and sculptures inside this building were directly carved from massive sand stones. When you go inside, there are many small rooms carved inside the stone wall for meditation. The stories of Buddha were carved amazingly in very hard stones. Moreover, animals, decoration flowers, monsters, angel, and giant figures are also created unbelievably by reducing art of stone carving. So, you can imagine how smart the architects and how creative the artists of Bagan era. The most famous figure is the giant with earrings of elephants. The carvings are made continuously on stones from floor to roof. Those twin pagodas are on the road from New Bagan to LawKaNanDar pagoda. They are called East Phat-Leik and West Phat-Leik. The unique thing of these pagodas is earthenwareversions of Buddha’s 550 lives. The inside corridor of East Phat-Leik has blocks of baked bricks on each side walls and on them, the 550 stories are described beautifully and meaningfully summarized in a single block with systematic captions and numbers. Moreover, other characters such as gods, angels, monks, prince, princess were also made with baked mud and this version is different from any other mural paintings of pagodas in Bagan. If you see the sculpture of beauty queen, OhnMarDanTi, you will be so amazed that you will doubt if this is the art of 1000 years ago. It was also called Taung-Bi-Nat-Htaunk monastery since it is besides Bagan harbor in Taung Bi village. It is built of over 160 teak pillars and is over 150 years old. The wood curving art in there is so fascinating and the whole building was decorated with various kinds of flowers, god, angels, and stories which are made purely with wood. You will be so stunned by the standard of art and the longevity of the buildings over a century of nature. It is a sima (or) ordination hall for monks in Bagan era. It is at the roadside of Bagan-NyungOo, near HtiLoMinLo temple. What special here is the unbelievable mural paintings. The cyanic green color on the wall is not very common in Bagan. The most famous picture is RaHuLar, Buddha’s son, asking Buddha for heritage. This story is so rare and not seen very much in other pagodas of Bagan. The stone-curving art flowers are decorating gracefully the roof of the building.There are also manly other features like stories of Buddha, Life of Buddha and his followers, Description of Hell in Buddhism. And this hall was also renovated in Kong-Baung era. So, you can compare the art features of Bagan era and Kone-Baung era. Culture means heritage for next generation. So, if you want to show your kids the art of Bagan, I would like to recommend this precious place. It is just besides Bagan museum. Insides, the four Kings who built the first Myanmar country, the four heroes of Bagan, the map of King AnawYaHtar’s Palace, architectural room, all about palm tree, cane ball sport, weaving art, Bagan musical instruments are shown attractively and understandably for children. In weaving and musical instruments, children can participate themselves. So, if you come to Bagan with your kids, don’t forget to come Children’s Museum and introduce them about wonderful Bagan. If you want to visit above places, please click www.green-myanmar.com. We are always ready to make your happiest trip to Bagan according to your wish.